July 2, 2018, 12:48 PM · "This is not the kind of concert where you're going to get bored and feel like it's never going to end," I said to a group of students. "I've seen this violinist play before -- you're going to wish that he would just keep playing all night!" After all, how often do you get to hear "La Folia" played on a Guarneri del Gesù violin from 1735? I was encouraging my students at the Los Angeles Suzuki Institute in Claremont, Calif., where I taught for a week in June, to attend a performance by violinist William Hagen, who was playing a recital especially for the students that afternoon. Hagen started violin at age four in a Salt Lake City Suzuki program, making his debut with the Utah Symphony at age nine. Now 25, he's already blazed an impressive path: he went on to study at the Colburn School with Robert Lipsett, at The Juilliard School with Itzhak Perlman and now at the Kronberg Academy in Germany with Christian Tetzlaff. He won third prize in the 2015 Queen Elisabeth International Music Competition and has played with a long list of well-known conductors and orchestras around the world. As a teacher, I was thrilled that the students in my master and group classes had the opportunity to watch an artist perform these pieces live. After all, students tend to hear mostly the pedagogy-oriented recordings and fellow-student performances of the works in the Suzuki books. It's an entirely new experience to see a performing artist of the highest caliber play these very same pieces. Inspiring! 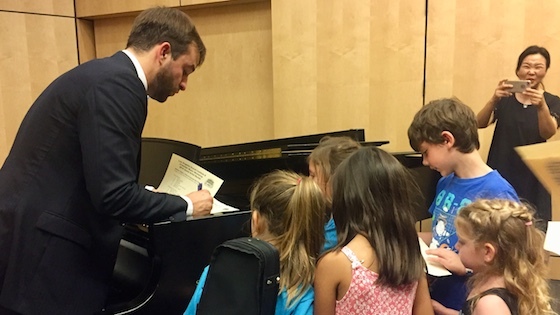 Not only that, but after the recital, Hagen remained onstage for nearly a half-hour, greeting the children, answering their questions and signing their programs. This was not the only wonderful opportunity that the students had during their week at the LA Suzuki Institute. In fact, sometimes I wish I could revert to childhood and have the "institute experience" for myself! Though I have taught violin for 30 years and have been part of the Suzuki teaching community for about 20 of those years, I was not a Suzuki student, as a child. It was only after I became a teacher that I realized that there are dozens of Suzuki Institutes that take place across the United States, and even more across the world, every summer. Basically it's a week of violin camp, in which you get a brief private lesson every day, a group lesson every day, plus other exploratory choices of enrichment classes such as (in the case of the LA Institute) fiddle; Dalcroze; jazz; art; chamber music; yoga. Plus, there are things like Hagen's recital; faculty recitals; play-ins; parent talks; face painting; swimming... Alongside all of the opportunities for young students, a group of teachers-in-training also took classes in Suzuki pedagogy, which they can register with the Suzuki Association of the Americas. I greatly enjoyed teaching all week at the LA Institute, watching students discover new things, and seeing them grow in so many ways over this intensive week of music study and fun. Here's to the new generation of young musicians! Laurie Niles, with the students in one of her master classes from the 2018 Los Angeles Suzuki Institute.